Satin Trimmed Chiffon Ribbon. Ribbon is 7/8 inch x 25 yds. per roll. 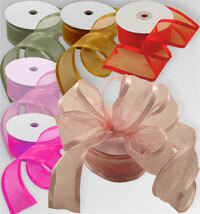 100% Nylon ribbon with satin bordered edges. Perfect for shaping into bows or decorations.